Modern personal computers have several things in common: a graphical user interface (GUI) that allows users to use a mouse to drag and drop text and images, icons that represent programs and files and windows that allow users to run several programs or have several files open at once. For software developers, modern programming involves things like object-oriented technology and the model-view-controller framework. Object-oriented design alone has had a massive influence on modern computer languages; it is simply a great improvement for the ability to model, conceptualize and realize complicated ideas in computer software. The majority of modern languages use object-oriented ideas and technology. All of this technology was invented or pioneered at the Xerox PARC, and it was all pioneered in or with Smalltalk. The creators of Smalltalk had lofty goals; they wanted to design Smalltalk to be natural, simple and easy for people to use. The bottom line is that Smalltalk was the enabling medium that allowed the sharp minds at PARC to realize incredible goals, and basically invent modern computing. Although many languages borrowed obvious features from Smalltalk, many other features intrinsic to Smalltalk are only now being recognized for their value. The design of Smalltalk has allowed Smalltalk’s control structures to be updated without redefining the language (unlike almost all traditional languages). Smalltalk has influenced the wider world of computer programming in four main areas. First, it inspired the syntax and semantics of other computer programming languages. Secondly, it was a prototype for a model of computation known as message passing style. Thirdly, its WIMP GUI inspired the windowing environments of personal computers in the late twentieth and early twenty-first centuries, so much so that the windows of the first Macintosh desktop look almost identical to the MVC windows of Smalltalk-80. Finally, the integrated development environment was the model for a generation of visual programming tools that look like Smalltalk’s code browsers and debuggers. Smalltalk continues to perform well, even among more contemporary OOP challengers such as Ruby, Perl, Python and others. In fact, an application built with Cincom’s VisualWorks® won the 2008 OOP Dynamic Language Shootout, proving that the first OOP language is still among the best. 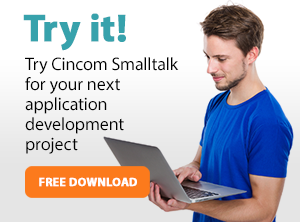 For all of these reasons, Smalltalk’s popularity continues to grow. Smalltalk is sure to be around for decades to come.